We started the day with listening to the previous night’s rough mix with Fab. 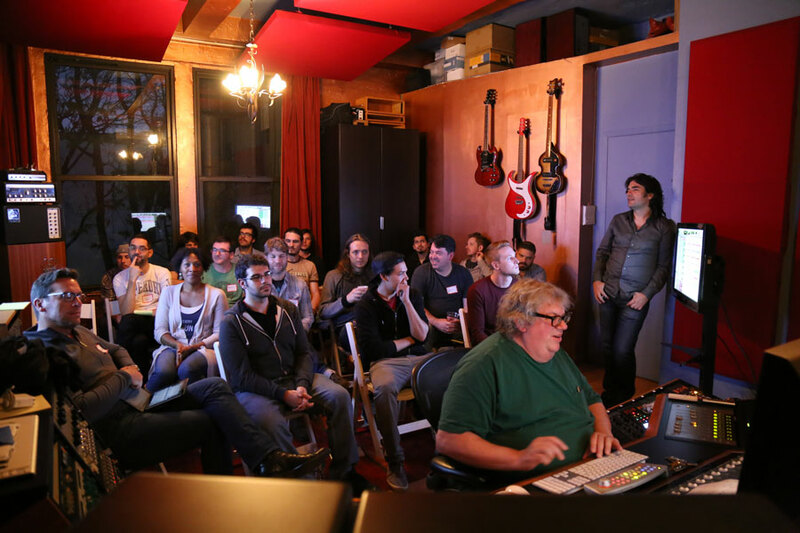 Then he took us through his session naming convention, which enables him to track mix versions with complete confidence. He also let us in on his use of DropBox to be able to quickly get mixes and other files to clients or have remote access to his sessions no matter where he is. He also discussed session etiquette and how vital proper communication is between the control room and the players in the studio. After some session setup and prep, Fab took us though comping the lead vocal from the previous days takes, some very slight tuning using Melodyne as well as his tasteful approach to tuning vocals for his productions. Then he turned the session over to Mick for mixing. Mick took us through how he generally approaches a session that has been delivered to him for mixing. He built his mix template from scratch in front of the class in order to walk the participants through how his template is set up the way it is and why. After the session was prepped, Mick started mixing. What a treat to be able to observe someone who has definitely mastered his craft. Mick paused often to answer questions by the participants, as well as Fab who highlighted certain topics and posed questions both to Mick and the class as certain things came up that he felt might need clarification to the participants. During the mix, Mick showcased many of his favourite plug-ins and showed how he set them up as he was dialling in the mix. At the end of the day, after a glass of champagne, we were all given a pair of Focal Spirit Professional headphones (which sound incredible), and a USB key with the tracks from the song. Everyone was welcomed to mix the track themselves and send the mix to Fab for him to critique. Mick, upon hearing that all the participants would be mixing the track expressed genuine interest in hearing the mixes, and how everyone would approach the production differently. Not only was being in studio for two days with such incredibly talented people as Fab & Mick an amazing opportunity, but to be able to have them critique our mix is the icing on the cake! I would highly recommend the Pure-Mix Masterclasses to anyone who is looking for some practical in-studio experience that is generally only accessible to a select few. There is always something to learn or a new technique to pick up, or a fresh perspective that can be brought to any production no matter what the scale, or budget.